Human norovirus infection is the predominant cause of gastroenteritis worldwide. No licensed vaccine or antiviral drug is available to prevent or contain infection. Until recently human noroviruses could not be grown in tissue culture, key features of their biology, including their cell- tropism, are unknown. 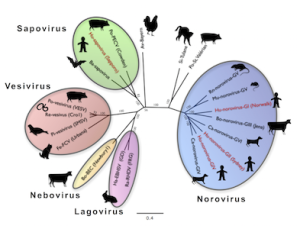 Most of our knowledge about noroviruses comes from animal caliciviruses such as murine norovirus and in vitro systems. Our long-term goal is to understand the early steps of norovirus infection. We are particularly interested in cellular and viral determinants of norovirus tropism and pathogenesis. Our laboratory has expertise in human and MNV animal models, carbohydrate receptor interactions, as well as structural analysis of proteins. Our investigations encompass structural analysis of protein-compound interactions that can be used for the development of platforms to design and test new antivirals. Our long-term goal is to shed light on the norovirus entry mechanism and evaluate, whether glycan-binding constitutes a general target to combat virus infection. We are embedded in the DFG funded research unit ViroCarb to study the role of glycans in non-enveloped virus infections. Glycans are carbohydrate structures that decorate all cell surfaces and most secreted proteins of vertebrates and higher invertebrates. They are attached to either proteins or lipids, and they act as ligands for many glycan-binding host proteins. All cells are coated with glycans, complex carbohydrates making up a layer on the surface of cells, referred to as glycocalyx. 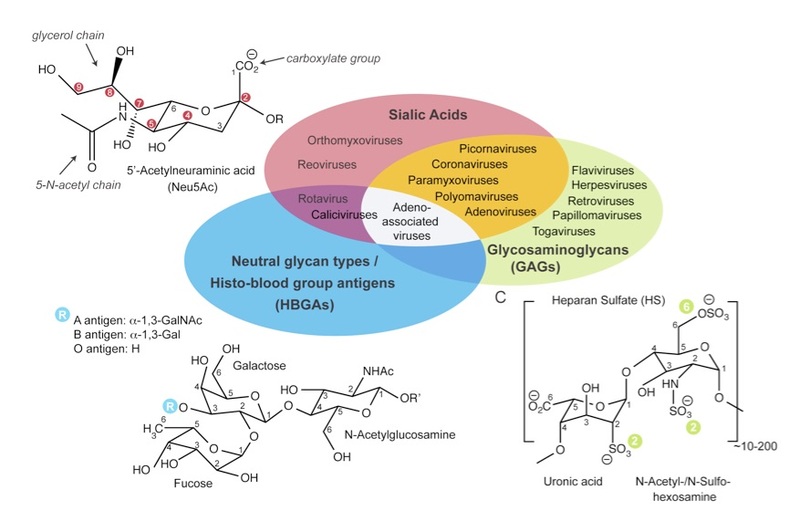 Glycans are both ubiquitous and diverse and viruses use them as attachment or entry factors targeting specific cells, tissues, or organs. The majority of noroviruses interact with distinct carbohydrates but how this is linked to the ability of the viral capsid to bind fucosylated glycans related to hist-blood group antigens (HBGA). The molecular mechanism of this interaction is not understood and focus our investigations. Figure from: Ströh, L.J. & Stehle, T., 2014. Glycan Engagement by Viruses: Receptor Switches and Specificity. Annual Review of Virology, 1(1), pp.285–306. Glycan-binding is important for infection because susceptibility to human norovirus infection and often correlates with the ability of the viral capsid to bind to hits blood-group antigens (HBGA). On epithelial cells, this process is genetically linked to a functional α(1,2) fucosyltransferase gene (FUT2), the determinant for the secretor phenotype of ABO blood groups. FUT2 attaches a fucosyl group to the glycan precursor producing H-type antigens. Epidemiological evidence, in vitro binding studies, recent cell culture systems, and challenge studies in volunteers, show that HBGA-binding correlates with susceptibility to infection. Firstly, we are interested in functional aspects: how does glycan-binding affect infection: For this, we use a broad range of molecular biology, cell biology and virology techniques, state-of-the-art cell culture assays, reverse genetics, and in vivo models. Cell culture assays are used to alter glycan compositions on the host, and reverse genetics is used to recombinantly modify the virus. Secondly, we are interested in biophysical properties of the virus-glycan interactions: Here we study the dynamics at atomic level, using structural approaches such as X-ray crystallography, SPR, and STD NMR. for this, we closely collaborate with members the ViroCarb research unit. Human norovirus is the predominant cause of sporadic cases and outbreaks of gastroenteritis worldwide and a significant global health concern. No licensed vaccine or antiviral drug exists to prevent or contain infection. In the past, human noroviruses could not be grown in tissue culture and key features of their biology are unknown. Recent advances in small animal models, co-culture systems, and stem-cell derived organdies now allow studying aspects of infection. However key bottleneck in norovirus infection is entry into the host cell. We investigate how various caliciviruses enter their host and establish infection. This involves developing new platforms to cultivate and study calicivirus infection.